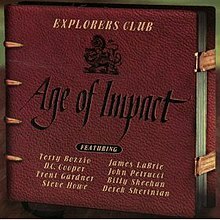 Age of Impact is Explorers Club's first album, released in 1998. The album included guest appearances by Steve Howe, John Petrucci, James LaBrie, and Terry Bozzio. Sound Temple Studio, Oakland, California.